Khamsah-i Nizami [Nizami's Quintet (Five Stories)], by Nizami Ganjavi, Nizam al-Din Abu Muhammad Ilyas ibn Yusuf (1140 or 41-1202 o4 3). 9 Ramadan 970 H/2 May 1563. 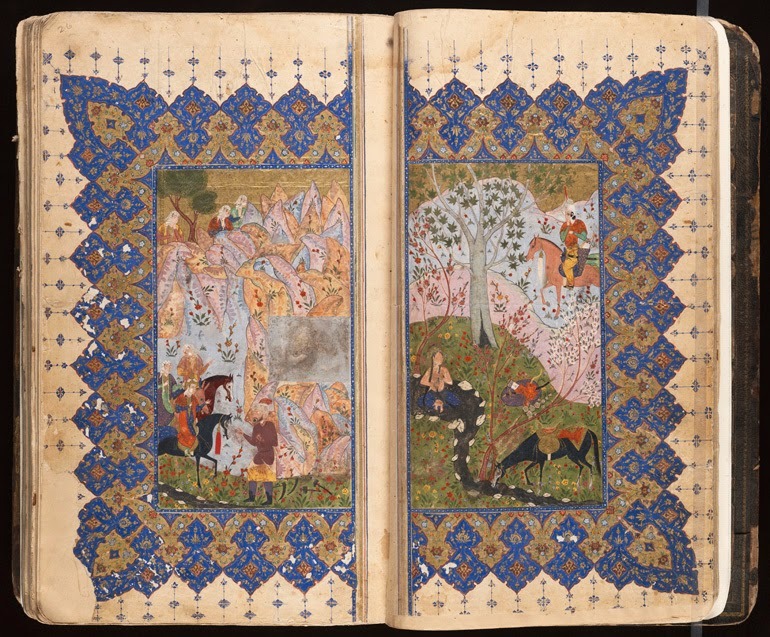 The five epic poems in this illuminated Persian manuscript are: 1. Makhzan al-Asrar [Treasure Chamber of Mysteries] 2. Khusru va Shirin [Khusro and Shirin] 3. Layla va Majnun [Layla and Majnun] 4. Haft Paykar [Seven Portraits (Faces, Images, Idols, etc.)] 5. Iskandar Namah [The Story of Alexander] (in two distinct parts: Sharafnamah-i Iskandari "Alexander Book of Honor" and Iqbal Namah "The Book of Happiness") The manuscript is written in clear and handsome nasta'liq script, on white glazed paper. The text is written in four columns and all the columns of poetry are ruled in gold. There are six illuminated headings in gold and colors and nine competently executed miniatures. There are also hundreds of subheadings illuminated in gold and colors. Eighteenth-century lacquer binding, re-backed in morocco, which is embossed in arabesque design in gilt on both sides of each cover. Nizami (1140-1202) is widely considered one of the greatest poets of Persia and his most important work is the Khamsah (Quintet), a collection of five epic poems, written between 1165 and 1189. Nizami's importance in Persian literature is due to his supreme skill and influence as well as his role in presenting the archaic style of the epic poem in a lyrical form that emphasized the psychological characterization over the heroic character. The present manuscript dates from the early Safavid period and is a fine example of Safavid calligraphy, handsomely illustrated with nine miniatures. In Persian.